If you haven't tried persimmons, you should definitely go and pick some up today! This salad is so refreshing and PACKED with nutrients! Just a few ingredients and you'll have a beautiful and delicious salad ready in no time at all! The combination of toasted almonds with the ripe and juicy persimmons is heavenly. Enjoy it with olive oil and balsamic vinegar as a simple and tasty dressing. This is a great salad to entertain your guests with over the holiday season; they'll be pleasantly surprised by the unique combination of ingredients! 1. 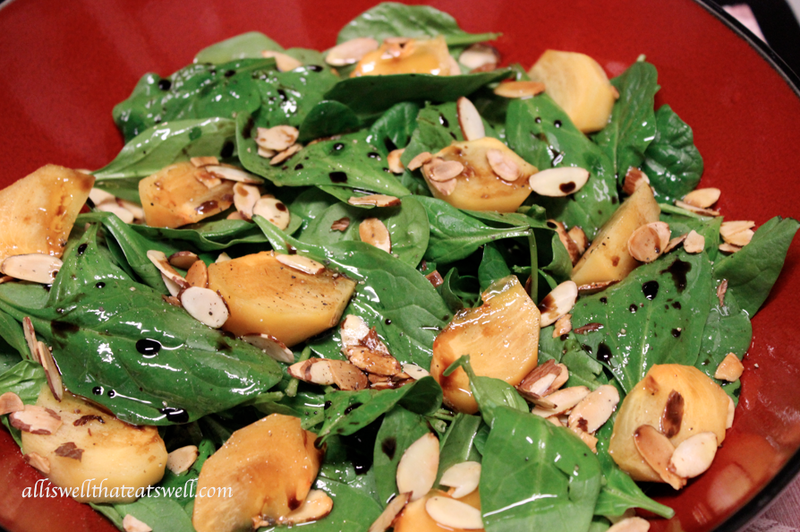 Arrange spinach and persimmons in a large bowl. 2. Place almonds in a pan and gently toast them over medium heat for a few minutes, turning them with a wooden spoon so that they don't burn. 3. Add almonds to salad and top with extra virgin olive oil, balsamic vinegar and salt and pepper to taste!